A Cash and Receipt is a printed document that is given by a business every time cash is received for goods and services. It is only done in the completion of sales as an acknowledgement of cash response by the business. Cash and Receipt are accounted for by debiting cash / bank ledger to distinguish the increase in the asset. Three Column Cash Book: Learning Objectives: Define and explain a three column cash book/treble column cash book. Prepare a three column cash book. 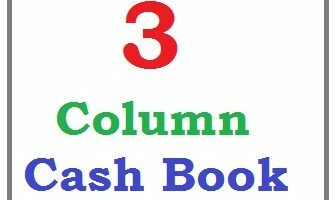 What is the difference between a single column cash book, a double column cash book and a three column cash book?